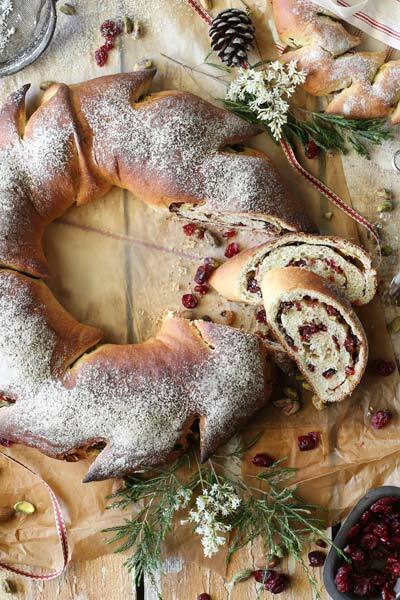 This bread wreath is the perfect thing to serve for guests to snack on as they wait for lunch to be served. In a large bowl, dissolve the yeast in warm water. Add the butter, milk powder, sugar, egg, salt and 3 cups of the flour. Beat on medium speed for 3 minutes. Stir in enough of the remaining flour to form a soft dough (dough will be sticky). Turn onto a floured surface and knead until the dough is smooth and elastic (about 6-8 minutes). Place in a greased bowl, turning once to grease the top. Cover and allow the dough to rise in a warm place until it has doubled in size (about 1 hour). Punch the dough down. On a lightly floured surface, roll the dough into a 45 cm x 30 cm rectangle. Brush with the melted butter. Sprinkle with the chopped almonds, cinnamon, pistachios, dried fruit mix and cranberries to within 1.5 cm of the edges. Roll up like a Swiss roll, starting with a long side. Pinch seam to seal. Place the roll seam side down on a greased baking sheet and bring the ends together to form a ring. Pinch the ends together to seal. Using scissors, make small cuts from the outside edge to one-third of the way towards the centre of the ring at 10 cm intervals. Open up the strips slightly twisting each strip to allow the filling to show. Cover and allow the bread to rise until doubled (about 45 minutes). Remove from the oven and allow to cool on a rack. To top, either dust with icing sugar, or alternatively, mix the icing sugar, water and almond essence together until smooth and then drizzle over the wreath before serving.